Home / Beer / Happy National Beer Day! I’ve got a little history lesson for you today. Stop yawning. This one is about beer, so I know you’ll love it. It’s about a very dark period of time in our American history that many craft beer lovers and home brewing enthusiasts don’t like talking about – the devastatingly dry 13 years of Prohibition. Luckily, on March 22, 1933, the country came to its senses. 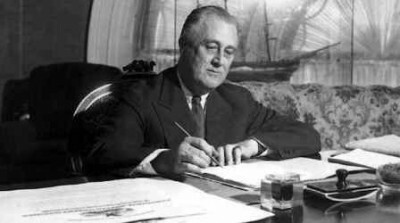 President Franklin D. Roosevelt signed into law an amendment to the Volstead Act (AKA the National Prohibition Act) known as the Cullen-Harrison Act, allowing the manufacture and sale of beer and other fabulous alcoholic beverages. On April 7th, that law took effect! However, people weren’t waiting around for the bars to open up at their regular times on the 7th. After going 13 years without a (legal) drink, they lined up outside of breweries and bars to buy that first legally purchased drink just after midnight. Since that year, the 6th has become Brew Years Eve and the 7th National Beer Day! So take a minute (or a few hours) out your day to honor National Beer Day by drinking a delicious craft beer or mouth watering home brew and imagine what the United States would be like without beer. And don’t forget to connect with us via Facebook or Twitter to stay up to date on everything beer related all year round.